Explore our revolutionary control system KePlast – perfectly designed for the plastics industry – and experience the full range of the latest hard- & software technologies at this year's FEIPlastic ! Together with our partner IMMAC, we are looking forward to your visit at Booth H58! KePlast control solutions cover a wide range of machines – from eco hydraulic up to complex, multi-component injection molding machines (IMM). The entire KePlast series consists of scalable hardware and a common software platform and enables the highest flexibility for any business requirements. The new control hardware generation provides the highest performance in combination with the shortest cycle time of 500µsec. The KePlast system is a ready-to-use turnkey solution, which can be upgraded anytime. Additionally, due to the Linux-based platform, customers are offered with the opportunity of customized individualization of hardware and software, easy adaption and smart integration of 3rd party applications. With innovation cycles becoming frequently shorter, the market demands a broad portfolio of new technologies that need to be integrated quickly and easily. At the same time, these systems must be scalable and highly flexible. The KePlast i-series provides the latest Industry 4.0 technologies which enable worldwide connectivity with cloud-based data management and smart IT integration. Both the hardware and software are optimized for injection molding machines. They offer numerous communication standards such as Ethernet with OPC UA, fast and secure data storage for predictive analytics and maintenance as well as further customer-specific adaptations. Through the partnership with KEBA, the IMM manufacturer benefits by having an expert at its side who plays a pioneering role in various areas, including the integration of Linux-based technologies and other cloudbased assistance services. ‘KePlast Smart Industry’ consists of the four main areas, namely KePlast Smart Factory, KePlast Smart Technology, KePlast Smart Engineering, and KePlast Smart Operation. KePlast EasyNet monitors the machine productivity on stationary and mobile (EasyNet Mobile) devices and is understood as Manufacturing Executing System (MES) for small and medium-sized companies. It provides access to all the machines of a plant incl. 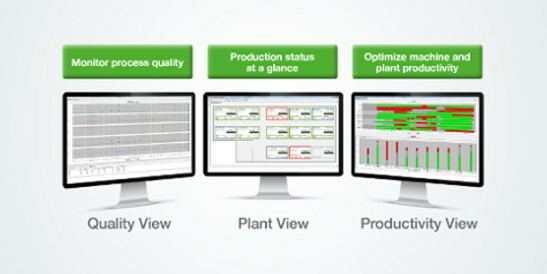 production status and quality data and process monitoring for maximum productivity. KePlast ServiceNet enables worldwide access to the machine and rapid problem solving by experts. Besides, the servers guarantee fastest communication. Visit KEBA at FEIPlastic, Booth H58 from April 22-26, 2019 in Sao Paolo, Brazil!